I happened upon a scene in Audubon Park. A man was feeding bread to the ducks, geese and fish. It wasn't much different than anyone else doing the same, except for the fellow pictured here. 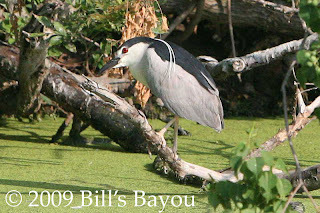 He's a Black-Crowned Night Heron. My wife calls it an evil bird, but more on that in a moment. What caught my attention was the attention this bird was giving to the bread on the water. The man told me the bird was waiting to catch a fish. The fish were swimming about eating the bread left by the ducks. Sure enough, after a minute, the bird lunged forward, snatched up a fish. I thought the event was interesting enough that I brought the family to the park on the following day. We traversed the park in search of the bird, and finally found him not too far off from where I'd seen him last. Unfortunately, the geese were exceedingly obnoxious and I couldn't get the bird to repeat the trick. The geese soon ran him off and we left as well. We didn't see where the bird had flown. Oh well, nature never repeats a good trick on its own. Sometimes it's funnier. Some hundred yards down, we found a mother duck and two ducklings swimming about. The kids were happy enough to feed the babies and they made such sweet "Peep Peep" noises. Just another duck feeding? Another family came down to the waters edge; a mother and her twin daughters. The mother sees the babies and says to her toddler girls "Look, girls! She's got twins. Just like you." And soon we were all feeding the happy family. Without warning, the heron leaped out of its hiding place in the elephant ears at the waters edge. The bird snatched up one of the ducklings from the surface of the water and quickly flew off; little baby duck crying out "Peep peep peep..." into the distance. A look of horror fell upon the mother of two as she hustled her girls away from the scene. My wife and children were outraged yelling at the fleeing predator while mama duck cried out for her missing duckling. 1) We came to see a predator bird. Well, we found it. It performed above expectations. 2) Cold smelly slimy fish are okay for birds to eat. Cute duckies are not. We came to the park hoping to say "Cool! The bird ate a fish," when what we got was "Holy Crap! That bird ate a baby duck!" 3) Never create an emotional bond between your twin daughters and vulnerable baby duckies in the wild. That, and always hustle your children away from the strange man who laughs hysterically when baby ducks are being eaten. That'll teach that mom to try and teach her kids stuff. Whatever! BTW, thanks for your comment the other week. I had to make mention of it in my post today!